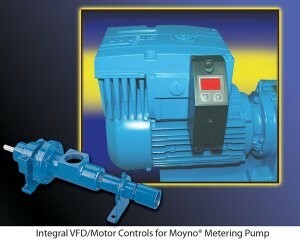 The Moyno Metering Pump includes enhanced pumping elements and integral VFD/Motor Controls that expand the scope of metering applications and enhance economical and efficient performance when metering low-flow liquids in a wide range of processing applications including dosing, sampling and metering. The integral VFD/motor controls also improve metering accuracy and repeatability. The progressing cavity design of the Moyno Metering Pump results in a smooth flow free from pulsations and variations in velocity and volume to prevent material waste or mixture imbalance.